It’s starting again. 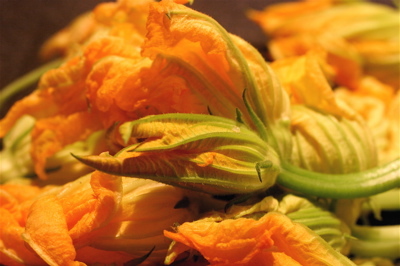 First it’s three little zucchinis, then a bottle of wine, and now a bag full of zucchini flowers. Who needs to go shopping when all you have to do is walk around town? On Sunday, our Montone-Portland friends came for a leisurely roof top lunch and brought an outstanding bottle of Domaine Drouhin Pinot Noir from the Willamette Valley in Oregon. It was too hot to drink it for lunch on Sunday, and since we don’t have a good wine storage system, we felt it was best to drink it sooner than later. So we drank it last night with a spicy chicken-shrimp-rice dish, and the wine just stood its ground against the chili onslaught, like it was Clint Eastwood saying, “Go ahead, make my day.” Finesse, combined with an easy command of the situation. It had notes of fresh red raspberries, and lavender, and a bit of vanilla in the finish. It was divine! The zucchinis came from Claudio & Martina’s orto. We were down at their house on Sunday for a picnic, which ended in a multi-generational game of leap frog (only they were leaping horses) and we couldn’t leave without taking some zucchini. Today Jeff is walking home, and he passes our friend Eva, who is coming out of her orto and she hands him a huge bag of zucchini flowers. What a treat!